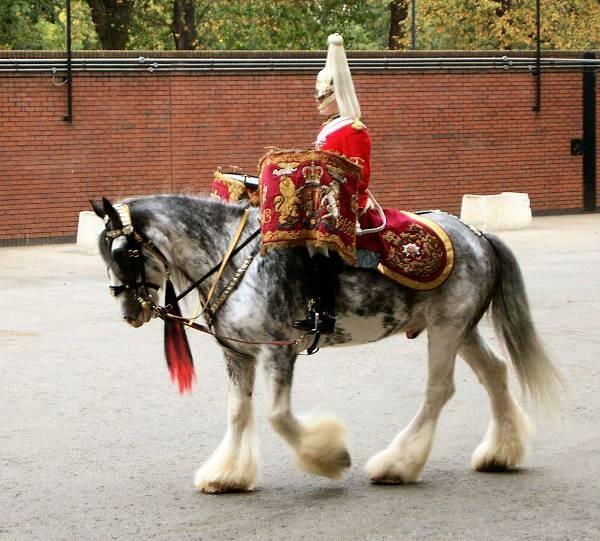 Drum horses were originally used by the Queen of England for her ceremonial band. They had to be large and sturdy enough to carry large kettle drums during any type of pageantry. This meant that they were required to carry a great deal of weight through crowds of people. The mounted drummers needed their hands free to play, so they controlled their animals via reins attached to their stirrups. They are an elegant heavy horse that utilizes the finest examples of the shire, Clydesdale, and gypsy cob breeds. On average they are 16 hands tall. In the US drum horses are favored more as riding and competition horses, both mounted and driving. They make sturdy, athletic mounts with a level head. Head attractive and well-proportioned Eyes expressive and kind Both convex and concave profiles acceptable Neck is long and well muscled Mane is abundant Chest is deep and broad Barrel is well-rounded with long well-set ribs Legs straight and clean Hooves are large with open heels Feathering is required of the breed and should begin above the fetlock joint and cover the hoof.